Serve with Tomato-Cucumber Salad- I was flipping through a Cooking Light magazine and came across Beef Kefta Patties with Cucumber Salad. Kefta? A quick internet search yielded my answer: Kefta is the Lebanese/Syrian dialect for Kofta- a Middle Eastern, South Asian and Balkan meatball or meatloaf, although it is also referred to as kefka in Morocco. In the Middle East Kefta is ground beef or lamb, typically mixed with cumin, paprika, minced onion, coriander and parsley. Cinnamon, hot ground pepper, and mint leaves are optional. The recipe below shows traditional quantities of these spices and herbs. I have, however, sautéed the kefta mixture in favor of forming into kebobs and made it as the base for a flatbread pizza. In honor of its Lebanese roots, serve it with a cooling cucumber-tomato salad. Heat oil in a large skillet over medium-high heat. Add onions and sauté until translucent, about 2 minutes. Add in the ground beef and brown for 1-2 minute without stirring. At this point add in the paprika and following 5 ingredients (through cinnamon). Stir to combine and continue to cook beef, about another 4 minutes. Turn heat down to simmer and add the fresh cilantro and 1/4 cup parsley. Combine well and turn off heat. Cover and set aside until ready to assemble the pizzas. Make the tomato-cucumber salad: Combine tomatoes, cucumbers, and onions in a salad bowl. Sprinkle with lemon juice and add in the basil and 1/4 - 1/2 cup parsley. Season to taste with salt and black pepper. Combine well, cover with plastic wrap and chill in refrigerator until ready to serve. Preheat the grill to medium-high heat. Place the toppings’ side of the flatbreads face down on the grill and grill 2-3 minutes until you see grill marks. Remove the flatbreads, grilled side up to a clean surface. Spread each flatbread evenly with 2 tablespoons Greek yogurt. 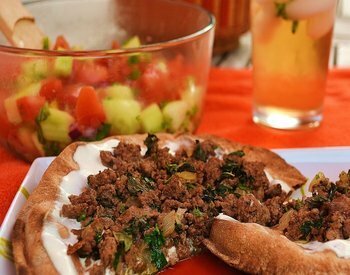 Divide the beef kafta mixture evenly amongst the flatbreads. Divide the mint evenly and sprinkle on top of beef mixture. Drizzle a tablespoon of olive oil on top of each flatbread. Place the assembled flatbreads on a baking sheet and slide to center of the grill. Close grill lid and cook for 4 minutes or just enough time to crisp the bread and reheat the beef mixture. Remove from grill and transfer to individual plates. Cut each flatbread in half and serve with a side of tomato-cucumber salad. Although this meal is pefect as is, my family likes to add crumbled feta or goat cheese as an additional topping prior to grilling. It makes it more "pizza" to them. The Moroccan version is very similar to the Lebanese/Syrian versions and is one of the most popular street foods in Morocco, usually cooked as kabobs. It is usually served in a flat bread and a tomato and roasted red pepper salad serves as a filler. If you would like to make it more Moroccan top your flatbread with the following recipe courtesy of About.com. Drizzle with a bit of harrisa (Moroccan version of Southeast Asia's chili-garlic sauces). Place the tomatoes, roasted green peppers, garlic, preserved lemon, and parsley in a mixing bowl. Cover and refrigerate if you won't be serving the salad right away. When you're ready to serve the salad, add the salt, pepper, cumin, oil and vinegar. Toss or stir gently and serve immediately.